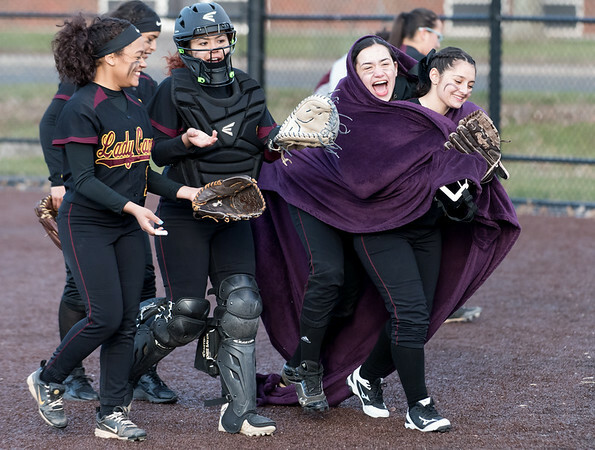 BLOOMFIELD - The Bloomfield softball team never stood a chance against Gianna Gonzalez. Not only did the New Britain senior not allow a single run, she didn’t allow a single hit either as the Hurricanes blew out the Warhawks 15-0 in five innings Wednesday afternoon. “She pitched great today,” New Britain head coach Joel Simmone said. Gonzalez, who struck out eight, had a chance at a perfect game before an error in the fifth eliminated the opportunity. She also got plenty of help offensively as the Hurricanes collected 18 hits. Cristina Velazquez reached base six times, collecting two triples and a single, while driving in four runs. Goodwin Tech 20, Cheney Tech 4: The Gladiators had quite the successful day, qualifying themselves for the state tournament for the second consecutive year. Valerie Ramirez was in the pitching circle for Goodwin Tech, striking out 10 batters. Ramirez and had two hits and four RBI. Katrina Tirado also had a single and one RBI. The Gladiators are now 8-6. Southington 3, Avon 2 (8 innings): With two outs in the bottom of the eighth inning, Kyle Leifert delivered for the Blue Knights. The junior hit a single to score scoring pinch runner Billy Carr. Justin Verrilli picked up the win for Southington after a clean top of the frame after Jake Nueman threw seven solid innings, striking out seven in the process. Jeremy Mercier and Jake Meade each had two hits for the Blue Knights. Goodwin Tech 6, Vinal Tech 4: A big second inning proved to be the difference for the Gladiators. Goodwin Tech scored all of its runs in the frame with Paul Prior providing the highlight of the inning with a three-run home run to straight-away center field. He now has three homers and 29 RBI this season. “He’s having a big year for us,” head coach Joe Granja said. Anthony DeCosta and Josh Alston had two hits apiece for the Gladiators with Matt Anderson picking up the win. Newington 5, Buckley 1: The Indians picked up an early lead in the first inning, a lead they wouldn’t relinquish throughout the duration of the game. Jack Kelly hit an RBI double and Ethan Errera was 3-for-3 with four runs scored. Newington is now 9-6 on the season. Newington 7, Buckley 0: It was a clean sweep for the Indians on the court. Olivia Rozio, Emmy Petronio, Abboy Molloy and Kelly Iskra all collected wins for the singles matches. As for the doubles it was Elli Wronka and Melissa Riggins, Julia Mazur and Lindsey Weaver and Samantha Miller and Blyne Warner-Hyde. Southington 6, Avon 1: The Blue Knights hosted the Falcons for what would be an exciting day. The match of the day was a thrilling three set match during the No. 1 singles. Southington’s Abby Murphy defeated SeSe Nguyen 4-6, 6-4, 6-1 in a contest that lasted two and a half hours. The Blue Knights also claimed the No. 2 and No. 3 singles matches. Coral Tommervik defeated Delia Hogan and Molly Murphy defeated Jessie Alessio. As for doubles it was a clean sweep. Carolyn Callahan and Chantelle Gimenez defeated Thy Pham and Sarvani Peesapati, Samantha Barmore and Madison Beaudoin defeated Emily Paul and Hannah Boruchov and finally Gianna Wadowski and Emma Wojcicki defeated Lilly Satlof and Haeun Lee. Southington is now 9-3 on the season and Avon is 5-5. Newington 7, Bulkeley/HMTCA 0: The Indians have improved to 7-5 on their season after sweeping the Bulldogs. Sean Davis, Matt Utter, Ben Arora and David Magsayo all collected wins in the singles matches. As for doubles it was Daniel Losata and Ateeb Rahman, Gynno Bacaoco and Josh Ellis and Lukas Klin and Michael Zhai all winning by forfeit. Berlin 11, Foran 7: The Redcoats had seven different goal scorers to top the Lions. Joe Patenelli and Mark Bednarczyk each scores three, while teammates Luke Barretta, Will Watson and Jack Lombardo scored one. Berlin took 23 shots on goal and Foran took 16. The Redcoats’ goalie Evan Graves made nine saves on the evening while the Lion’ Sean O’Connor made 12. Berlin is now 10-3 on the season. Posted in New Britain Herald, Berlin, Goodwin Tech, New Britain, Newington, Southington on Wednesday, 9 May 2018 21:17. Updated: Wednesday, 9 May 2018 21:19.